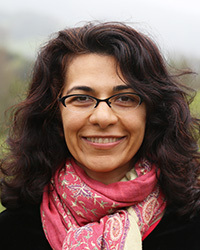 Nikki Mirghafori, PhD, started contemplative practices and yoga in the early 1990’s as a teen. She has practiced primarily in the Theravada tradition since 2003. She received authorization from her teacher, the renowned Burmese meditation master Venerable Pa Auk Sayadaw, to teach jhanas and a detailed analytical method of vipassana in 2008. She is also a Stanford-trained compassion cultivation instructor and a UCLA-trained mindfulness facilitator. Invited by Jack Kornfield to join the four-year Spirit Rock/IMS Teacher Training in 2013, she was mentored by Gil Fronsdal and Guy Armstrong. Nikki is of Persian heritage, and was known as an artificial intelligence scientist and academic in a previous incarnation. Nikki serves on the Teachers Council, as well as the Board of Directors at Spirit Rock and the Insight Meditation Center in Redwood City, CA. She offers classes, daylongs, retreats, and individual dharma guidance to practitioners nationally.